A Harris Poll indicates that younger Americans not as "green" as other generations in America Recycles Day Survey. Given that millennials have grown up in an era of increasing environmental awareness and environmental education in school as well as elsewhere, one would suppose that their recycling habits would be more ingrained and effortless than for older generations. According to the poll, sponsored by ISRI, the Institute of Scrap Recycling Industries, however, the younger generation may be less "green" than previously believed by many. That poll, conducted through an online survey of over 2,000 U.S. adults, found that younger American adults in the 18-34 age range are significantly less likely to say they always recycle to the tune of 33 percent versus 48 percent of people aged 35 and older. Younger adults in the18-34 year age group are also more likely to say they wish they recycled more than any other age group - to the tune of 37 percent versus 22 percent of people 35 years and older. According to the poll, Americans would like to see better accessibility for recycling. Some 90 percent of Americans believe that recycling collection sites should be more conveniently located. 65 percent of Americans agree they probably would not recycle a product that is not convenient to recycle. There is a degree of skepticism about recycling. Those with uncertainty as to whether an item is a recyclable number 26 percent, while 6 percent indicate they don't believe that items they put in the recycling stream actually get recycled. Those in the 18-34 age group (33 percent) are more likely to say they are uncertain whether or not an item is recyclable versus people 35 years and older (22 percent). Overall, some 40 percent of Americans believe recycling is crucial to the reduction of energy consumption, however, adults aged 65 years and older are more likely (46 percent) than those in the18-34 age group (36 percent) to say this. 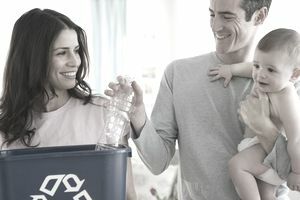 A whopping 94 percent of Americans indicate they recycle, however, those aged 35 and older are more likely (48 percent) to say they regularly recycle than the 18-34 age group (33 percent). Older people say they recycle more. For people 65 years and older, 54 percent say they regularly recycle versus 43 percent for the 35-44 age range. In a similar vein, while 68 percent of Americans believe recycling is the right thing to do, the percentage trends downward with age, with just 62 percent of the 18-34 group stating that belief versus 78 percent of people 65 years and older. Are Young People Bad Recyclers? While the evidence falls in line with the opinion of many experts who would suggest that more work needs to be done with younger generations to instill recycling beliefs and behaviors, the study creates a number of questions. For example, is the skew between young and old something new, or has it always been a factor? Given that young people generally consume more, are more active, and less structured in lifestyle than older people, this would tend to make recycling less convenient. Furthermore, does this result suggest that school recycling education is ineffective, or is it more of a lag as today's school children eventually enter adulthood? Certainly, more research is needed, and with a continued focus on convenience.